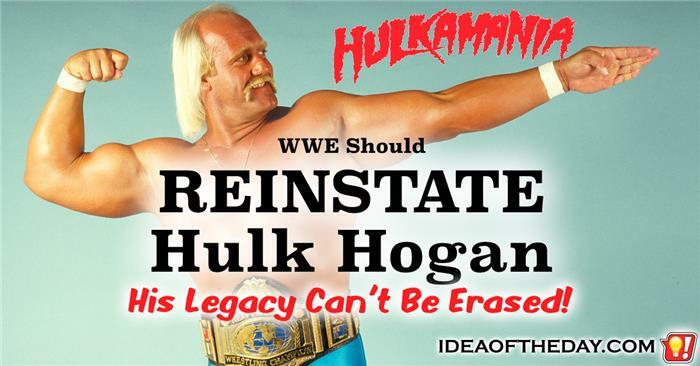 You can't erase the legacy of Hulk Hogan! The WWE made a big mistake when they not only terminated his contract, but decided to erase his legacy from their history. Removing Hulk Hogan from web sites, video archives and other promotional products is nearly impossible without erasing the very DNA of the WWE itself. Hogan is, by far, the most recognizable wrestler in the history of the WWF & WWE. Even people who've never watched wrestling know who he is. Simply stated, removing Hulk Hogan from the history of the WWE is not only unfair to Hulk Hogan, who played a huge role in the explosive growth of the WWE, but it's unfair to fans who have followed him for over 3 decades.